Blurb: Rose Justice is a young American ATA pilot, delivering planes and taxiing pilots for the RAF in the UK during the summer of 1944. A budding poet who feels most alive while flying, she discovers that not all battles are fought in the air. An unforgettable journey from innocence to experience from the author of the best-selling, multi-award-nominated Code Name Verity. From the exhilaration of being the youngest pilot in the British air transport auxiliary, to the aftermath of surviving the notorious Ravensbruck women's concentration camp, Rose's story is one of courage in the face of adversity. Code Name Verity is shortlisted for the Carnegie Medal. Title Page: *reads all the names* This book is scaring me already...WHO ARE THEY?! Page 16: Well you're a poet and a half.. Page 33: Don't worry Lady Beaufort-Stuart..I THINK THEY'RE SILLY TOO...although he does have a point. When Hitler's angry, he aint no cup of tea. Page 44 :i disagree. crazy isn't the word.. Page 76: CAN I BUZZ IT WITH YOU?! Page 80: No no no you're freaking scaring me what happened? Page 94: OMG OMG ROSE.. Page 96: Trust me, you don't want to know.. Page 100: You go girl! Page 112: A mirror and a comb?! I'm laughing too. Page 166: Keep standing Rose, keep standing. Page 250: lemonade... guys. do i have permission to cry? Page 296: ALL the rabbits?! No...no! Page 315: You stinking weasel. Page 363: i can't believe you lost them. I decided to do a mini-freak out post for this because i didn't think i would be able to explain my feelings for this book any other way. it literally just made you feel a hundred different emotions and was so gritty, and heartbreaking and overpowering and i just. i can't. If you have the strength. then read this book. 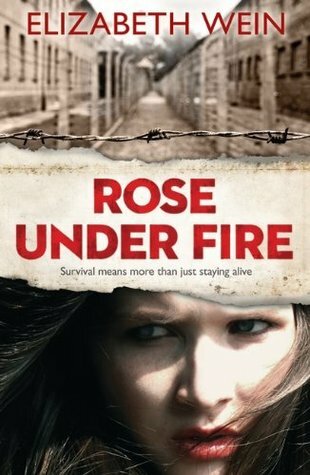 and if you don't then i don't blame you but Rose Under Fire was seriously scary and at times i just wanted to put this book down, but there was always this invisible thread dragging my eyes left and right. left and right. left and right. i just couldn't stop. Some of the things i read in there, especially about the Rabbits, made me want to vomit. I just couldn't believe HUMANS could do this to OTHER HUMANS. And yes i've read about concentration camps, and eyewitness accounts and life during the war, being a history freak....but i don't know, this book made things real. Elizabeth Wein has the talent to make you feel like you are living inside her book. It was as I was living life at Ravensbruck with Rosie and Irina and Rozycza and Lisette and all the other women, and i didn't like it one bit. One of Rose's poems stood out for me, much more than the rest, although they were all beautiful and evocative. Maybe because it was about hope, and that was the running theme of this story. That no matter what happens. Never give up hope. Because even when you think all is lost - you can still pull through. "But people need lift too. People don't get moving, they don't soar, they don't achieve great heights, without something buoying them up." At the end of reading this i was speechless. Rose Under Fire will overpower your mind and your thought and you will be able to think of nothing else for days. Even now. A few days after finishing it, i am still thinking of the book, and the horrors that lie within it's pretty cover. But even today: new horrors are facing people now. We aren't history. Yet. *Thank you so so so so much for Nikki from Fiction Freak for coming up with the amazing idea of 'Mini-Freak Out posts and for letting me do them too. :) You can see all her hilarious funny Freak Outs right here. No i actually read Rose Under Fire first, i've just started reading Code Name Verity, i don't know why i read the second one first although they're not in any order so..i just felt like reading this one first although I hear Code Name Verity is better so I'M EXCITED! I LOVE THE SOUND OF THIS NOVEL! This sounds incredible and I'm definitely going to try and get my hands on a copy. That's one of the really strange things about reading books like this, they're scary. What happened to those women doesn't feel like it's real. Your review is so funny, but fabulously written Hawwa! And that poem you've taken from the book is beautiful - I wish I could write like that. Yes so do I..*sigh*, it's one of my personal favorites because of the message behind it but all of them are fabulously written.. I KNOW! THAT IS EXACTLY WHAT A MODEST PERSON WOULD SAY ASWELL! WE SO OVER-USE CAP-LOCK! Is this a sequel to Code Name Verity? Because its on NetGalley, but I haven't read CNV yet and even though I'm not a fan of historical fiction, they look reaaaally good. And I love the freak out style! Thank you it was all Nikki's idea. :) It's not no, so you can read either one first, i've got both books but i decided on this one first because i just felt like this sort of story, so you can read either first, i HAVE heard that Code Name Verity is better than Rose Under Fire but really i don't know how it could live up to my humongous expectations that i know have of it..you never know! I'm sure i'll love it though, Rose Under Fire was AWESOME though and even though you don't like historical fiction you should really give it a go. :) Tell me what you think if you do! Thanks for stopping by and sorry for such a long paragraph! Wow, sounds intense! Historical fiction isn't my Niche, but you sure made Rose Under Fire sound tempting. I might just put this on my TBR list. Um......*eyes ARC on my kindle* I'm scared, Hawwaaaaa. I'm so scared :( Have you read Between Shades of Grey? That's meant to be just as heart wrenching!!! REBEKAAAH! read it now! It is kind of scary BUT SO WORTH IT. YOU HAVEN'T READ BETWEEN SHADES OF GRAY THATS LIKE ONE OF MY MOST FAVOURITE BOOKS EVER GET TO IT. This is an amazing mini freak out! I was already willing to sell my soul for this book were it to come to that, but you just made me even more excited. Books that horrify you as much as you said this one does are the best; they are brave and stick with you longer than any other type of tale. And your statement about these kinds of things going on today is so true. Someday, people will be writing historical fiction about 2013 and shocking readers with descriptions of all our saddening current events. On a less intense note, I just wanted to say your "nerds being unironically enthusiastic" comment button is brilliant. John Green is pretty much my favorite person ever. *sigh* Hopefully that means that things will be better in the future, although I doubt they will be entirely. We don't have the genocide problems this time period did, but 2013 definitely has its own struggles. I bet future humans will look back at, say, the way we damage the environment and shake their heads, but they will be worse off in some ways. This is depressing to think about. Well.. I am definitely reading this now! Don't know what else to say. I really want to read this, and Code Name Verity! I've ordered them into the library, but they haven't come yet. I love this way of reviewing, I might try it sometime for a shortish book... Anyhow, great review! Why thank you Rachel *bows* SO DO I!! I surprised myself by not crying much. It was just so overwhelming that you didn't. if you see what i mean? Thanks. AND YES YOU MUST READ BOTH BOOKS! Hawwa! If you could have seen my face after I finished this book. I was totally overwhelmed and impressed and heartbroken too. And yes, reading about all that stuff is HORRIBLE, especially as you know that it's happened, and that similar things are happening to people all around the world today. THIS LOOKS SO GOOD I MUST READ IT BUT I AM DREADING IT SIMULTANEOUSLY BECAUSE OF WHAT YOU'VE SAID AND DSLFKJASLDKFJ;ADSLFKJ THAT IS ALL KAYTHNXBYE. I have a question, for a project i was asked to think of three things Rose Justice wanted or needed, i have two of three. Any help?? Please and thanks! And this book is amazing!! Hi! Thanks for the comment, what do you have so far?